Something I’ve found myself doing lately, almost by accident, is having a much more consistent morning routine. Rather than setting out with this in mind, it’s been a side effect of two of the goals that I set at my last personal retreat. First off, I set a goal of writing every single day. No specific target for how much, or what to write. It could be 5 minutes working on a blog post or an hour working on a novel (or vice versa). The goal is just to sit down and spend some time moving the cursor every single day (and if you look at the number of blog articles I’ve published in the past few months it’s obvious that it’s having a positive effect on my output). The hard part was finding time to do this. I already established a habit of exercising every morning (it was pretty much the only thing in my morning routine that was consistent). I didn’t want to give that up. While I don’t have a fixed time when I’m required to be at my desk at work most days, I didn’t want to push that any later than I was already doing. I did have a bunch of time that I was spending messing around on the internet (including reading through the overnight posts on the MPU forum). I found that this aimless messing around online was often the monster that ate the rest of my morning routine. Imposing a bit of order on that could help me find some time to write, but not as much as I wanted. I decided to bite the bullet and move my alarm back from 6am to 5:30. The extra half hour, combined with imposing some discipline on my morning internet usage, would give me some time to write. One of the ways I’ve imposed that discipline is my goal to time block each day. In fact, the morning has become by far the most consistent part of my schedule (particularly on weekdays). On weekdays I could basically copy and paste everything before 9am and only have to deviate from it a couple of days per month. With the help of multiple alarms on my phone and a clock radio across the room, so I physically have to get out of bed to shut it off, I get up at 5:30 every morning. The “every morning” bit is important. I am not naturally a morning person. If I sleep late one morning, it throws off my sleep schedule for days afterward. From 5:30 to 6 I drink a glass of water and read the MPU forum and the news on my iPad. At 6 I pry myself away from the internet and do my morning exercise routine. This generally takes a little over an hour. Throw in a shower and some breakfast and about 7:45 I’m ready to start writing. I’ve got 45 minutes to write before I have to head out the door to work. As morning routines go, this is certainly nothing earth-shattering. Exercise, shower, and breakfast are about as typical as you can get. What I thought was interesting is how consistent it’s become without explicitly making consistency a goal. It’s really been a side effect of the writing and time blocking goals. Is time blocking right for me? Recently I posted about how I schedule my whole day using time blocking. This sort of thing can be controversial, and it clearly doesn’t work for everybody. Some of the conversation around this got me thinking about what makes it more suited for some folks than others. I think a lot of it has a lot to do with what kind of work you do. Think of work as a spectrum: On one end of the spectrum is work that’s completely interrupt driven. For instance, a manager who spends all of his time responding to emails and phone calls from other people and dealing with urgent issues as they come up. On the other end of a spectrum is work that’s completely predictable and consistent. Say, assembly line work. If your work is very interrupt driven, where most of your day is spent reacting to stuff that comes in, time blocking probably isn’t going to be very useful. There’s just not enough predictability to plan out your day in advance. It might seem that time blocking would be helpful for very routine work, but if the routine is totally consistent time blocking isn’t really that helpful. There’s no reason to sit down time block each day if all you’re doing is repeating the same schedule over and over. Where time blocking really works best is in the middle of the spectrum. The work is variable enough that planning is useful but consistent enough that planning is possible. This really boils down to lead time. If you can’t know what you’ll be working on 15 minutes from now, time blocking is impossible. If you know what you’ll be working on at any given time next week or next month, time blocking is unnecessary. The sweet spot is when you can plan out the rest of the day or tomorrow’s work with reasonable certainty. Of course, this is an oversimplification. Lots of people’s work is a mix of different types. There are times when you get interrupted even in the most consistent of jobs. And even in very interruption-driven jobs, there might be some things that are totally consistent, like weekly meetings. While time blocking is most useful in situations where most of the work falls on the middle of that spectrum any time blocking system needs to be adaptable to some level of interruption and some level of consistency. Of these, dealing with consistency is much easier. Those regularly scheduled events can be the skeleton that you build your time blocks around. Interruptions are trickier. At a basic level, it may just amount to staying flexible and not getting too committed to your time blocked schedule. If it’s a quick interruption, you may be able to deal with it and get back to your planned time block, but sometimes you just have to roll with the punches blow up the schedule. I like David Sparks’ description that, “A calendar is a soup, not a puzzle.” Sometimes you need to stir the soup. Another alternative might be scheduling your interruptions. “Scheduling interruptions” may seem like an oxymoron, but depending on how time sensitive the interruption is, it may be possible. If most of your interruptions can wait a few hours, you might be able to do something like scheduling a block of time at 11 o’clock to deal with all the interruptions that came in that morning (this is effectively what the advice to only check your email twice a day is doing). Similarly, you may be able to set up “office hours” when you’ll be available for walk-ins from colleagues and others while walling off other time in your schedule to do deep work. Time blocking isn’t for everyone. Depending on the type of work you do it may or may not be suitable (not to mention other issues, like whether it fits your personality or how much control you have over your work). Even for those who find time blocking suits them, it’s not going to work the same way for everyone. That said, it can be a very adaptable practice. My time blocking practice evolved out of some of the things Shawn Blanc talks about in The Focus Course, mixing in some ideas from the “Ideal Week” exercise that Mike Schmitz covers in his Personal Retreat Handbook, and some of David Sparks’ posts on scheduling his day (see posts here, here, and here. When this happens, I just have to “roll with the punches” and adapt. I’ll push another task off until tomorrow, substitute a shorter task for a longer one, or drop something entirely. As David Sparks put it, “A calendar is a soup rather than a puzzle.” Sometimes you have to stir the soup. Back in 2017, I wrote an article on Inventorying my Tools, going through the software I use to get work done on a regular basis. Now, about two years on I thought it would be interesting to go through and see what’s changed. This list focuses on work (and side project) related apps. It excludes purely personal and recreational apps like Reeder and Paprika. It also only covers things that I think of as “real apps” as opposed to menu bar applications or little utilities like Yoink or TextExpander (though that line is kind of fuzzy, given my inclusion of 1Password). A fair number of apps have gone by the wayside. Bear, Byword, Ulysses, and Scrivener have all been replaced by iA Writer. Toggle has replaced Hours, and Sublime Text displaced TextWrangler. And, of course, Workflow has turned into Shortcuts. There are some outright additions that represent categories that I didn’t even have on my list two years ago. Many of these are iPad apps like Files and Goodnotes, a consequence of my increased use of the iPad as a work and travel device. Others like Luna Display and Jump Desktop are related to my Mac mini home server. As I said two years ago, I think part of the value of this exercise is not just listing the apps, but thinking about why I use these apps and whether there are any changes I could make to get my work done more effectively. Are there some of these where I would benefit from learning to use them better? Which ones do I want to use more often? Which ones do I want to use less often? Are there tools that don’t fit my needs anymore? What tools aren’t I using that I might benefit from? For instance, last time around I’d expressed a desire to transition Word from something I use every day to an app that I use more occasionally. While I’ve probably reduced the amount of time I spend in Word, I haven’t been able to cut back as much as I would like. My writing generally starts in a text editor, but at the point where I need to share things with other people at work, it makes the transition to Microsoft Word. One area where I have made progress since the last inventory is in reducing the number of text editors I use. Byword and Scrivener were already on the way out, but for most of that period, I divided my writing between Bear and Ulysses. Now that I’ve switched to iA Writer I’m down to one app for writing prose (with Sublime Text for writing code). That simplifies things in a lot of ways. One area where I’m still in the midst of a transition is going from taking all my handwritten notes on paper to doing more of it on the iPad Pro using the pencil. The Field Notes Steno Pad still gets plenty of use, but probably about half of my notes are made on the iPad in Goodnotes. I’d like to continue to move in this direction. I still don’t feel like I’m getting as much as I could out of Drafts or the Shortcuts app. My primary use case for both of them at the moment is as a front end for OmniFocus: Drafts as a quick entry tool and Shortcuts to set up templated projects. I think I’d benefit from delving deeper into these (as well as Scriptable, which didn’t even make the list). Due to some changes in my work, I’m not doing as much coding as I used to. I’d like to exercise that muscle a little more, even if it’s just as for some sort of side project. In addition to notebooks (Field Notes and Bullet Journal), the other analog tool on the list is the whiteboard in my office at work. A couple of years ago I was using it to keep track of progress on the many projects I was responsible for, but that has kind of fallen by the wayside as more and more of my time has gotten sucked up into one big project. Taking a big picture look at what apps I’m using and why is definitely a useful exercise. I carried through on some of the changes I made two years ago, and I’ve got some more in mind that I want to make based on this new inventory. If anything I need to do it more often than every two years. In an earlier article I related my experience spending a month using my iPad Pro with an external monitor. The external display has some real ergonomic benefits, putting the screen up at eye level rather than down on the desk. However, it does create an odd and unnatural divide between the display, where I can look while I read or type, and the iPad itself, where I need to look to swipe or tap. The next stage of my iPad experimentation has been to get a tall stand for my iPad, raising it up to about eye level. 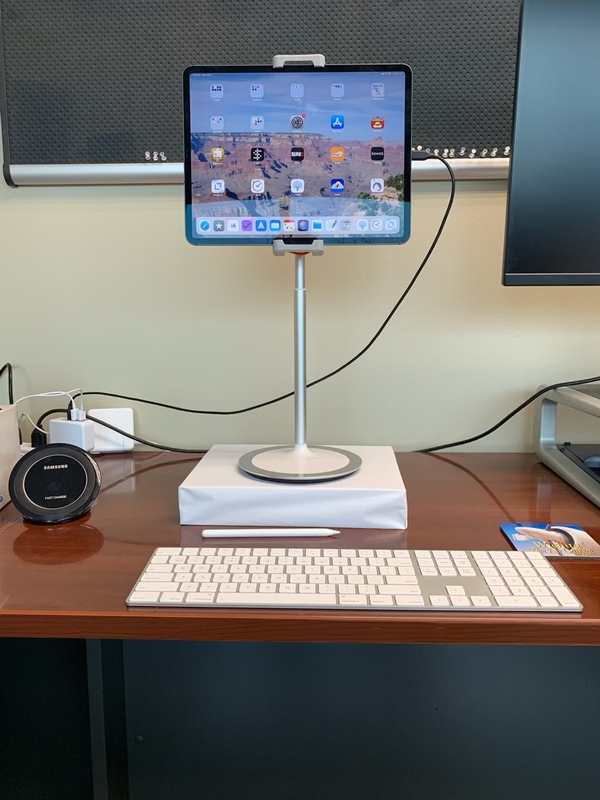 In this case, I’m using the iPad Stand for Desk, Aluminum Height Adjustable Swivel Stand and Holder for iPad Mini Pro Air Tablet Up to 12.9″ iPhone Galaxy Phone iPad Bussiness Office Kitchen Display Charging Dock Accessories.1 This stand was recommended by Myke Hurley on Upgrade. While this is a very tall iPad stand, I’m still using a ream of paper underneath it to raise it a little higher. I’m also still using the Apple Magic Keyboard with the numeric keypad. My initial reaction was that after spending a month with my iPad’s screen on a 27″ monitor, even the 12.9″ iPad seems tiny by comparison. It’s by no means too small to use, but there’s definitely a different feel to it than using a big external display with the iPad (or my 27″ iMac, for that matter). Of course, the biggest change to interacting with the iPad on a tall stand is the need to reach up to interact with the screen. With the iPad in a Smart Keyboard Folio or the Elevation Labs DraftTable that I used with the external monitor reaching the screen is a matter of moving my hands a few inches. With the tall stand, it’s more like moving my hands a few feet. This is definitely “zombie arms” territory. In contrast to using the iPad with an external display, there’s no confusion about where to look. As a display device, when reading or typing, the iPad works just fine. Once I got over my surprise at the size difference the screen was plenty large enough to read easily. The flip side of the ability to rotate into portrait is that it can be a bit of a challenge to get the iPad exactly level and centered in the stand. Maybe it’s just my OCD’ish tendencies, but I find this bothers me quite a bit. It’s also more trouble to get in and out of the stand. With the Elevation Labs DraftTable, I could just flip the Smart Keyboard around the back, set it on the stand and plug in the external monitor. With this stand, I have to take the iPad out of the Smart Keyboard Folio and go through a somewhat fiddly process to get it into the spring-loaded rubber clamp that keeps the iPad in place. One minor annoyance is that in the stand I’m not able to put the Apple Pencil in its usual spot atop the iPad Pro. Always having the pencil available and ready to go is one of the best features of the iPad Pro. If I were to go with this sort of setup long-term, I’d definitely want some kind of pencil holder on my desk so that there would be a spot for it. For now, I’m just putting it on the desk between the keyboard and the base of the stand. When I first started my experiment using my iPad Pro with an external display, the question I was trying to answer was “can an iPad Pro replace a Mac on my desktop at work?” Given that I’ve gone two months without needing to do anything substantiative on my Mac3, the answer seems to be yes. Unlike a lot of people, my main challenge in using the iPad as my primary work computer was always ergonomic rather than about the software. Things I use my Mac for at work (editing text in iA Writer, managing tasks in OmniFocus, browsing the web in Safari, and reading and replying to email in Spark or Apple Mail) can all be done on the iPad. Any other tasks can be done on my work-issued PC. The challenge has always been that, for me, working for an extended period using an iPad in a Smart Keyboard (or a traditional laptop for that matter) was never that comfortable for me. I want better ergonomics, with a display up at eye level. Both using an iPad with an external display and putting it in a tall stand solve this ergonomic issue. At another level, however, neither if these iPad setups really feels optimal. Using the iPad with an external display creates an awkward blend of direct and indirect manipulation. Using it on a tall stand requires my hands to come a long way up from the keyboard to manipulate the screen. If I had to pick one, it would probably be the external display, but it’s still a compromise. These disadvantages are significant enough that now that the experiment is over, I’m planning on going back to my MacBook Pro hooked up to a nice, ergonomically placed external monitor as my daily driver at work. If my MacBook Pro were to die, though, that would put me in a difficult spot. Are the disadvantages of using the iPad in this role significant enough to justify dropping over a thousand dollars on a new Mac? That’s kind of a hard sell either way. The Mac definitely provides a more natural, compromise-free desktop experience, but a new laptop or Mac mini would be a pretty substantial outlay compared to an external display that I could use with the iPad Pro I already own. At this point, I hope that my MacBook Pro will hold out long enough for Apple to make improvements that would make the iPad Pro a better fit for this kind of role. This could be support for external pointing devices, but it could also be better support for keyboard shortcuts (by both apps and the OS) so that I could get more done without tapping and swiping on the screen. I’ve been a longtime listener of the Mac Power Users podcast. I started listening about nine years ago and haven’t missed an episode since. Recently, co-host Katie Floyd left the podcast and was replaced by Stephen Hackett, one of the founders of Relay FM. Among his many other titles, Stephen is Relay’s Senior Vice President of Live Events, and it didn’t take him long to bring that expertise to Mac Power Users. 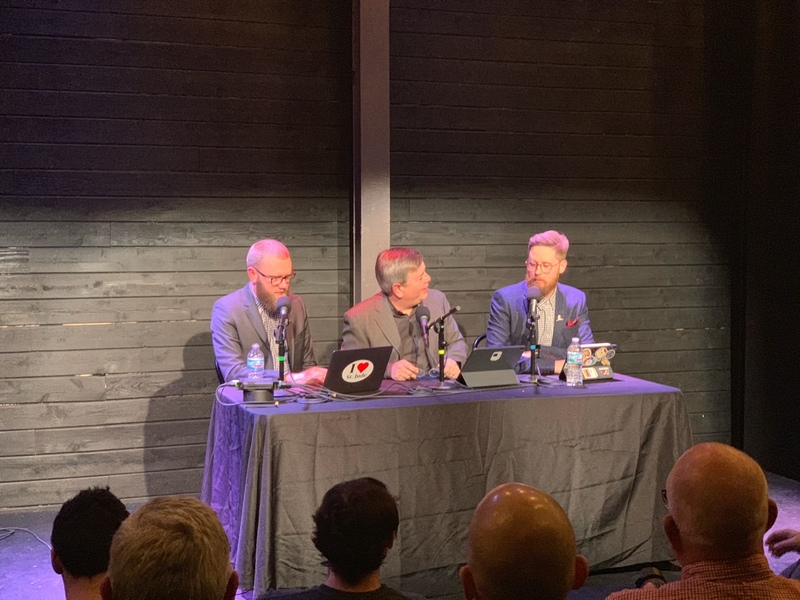 When I saw that MPU would record a show live in front of an audience in Chicago in early March, I jumped at the chance. I was able to grab one of the tickets that included not only the show itself but a meet and greet with Stephen and David Sparks after the event. As much as I like MPU, flying to Chicago just for a few hours seemed like a bit of a waste, so I decided to make a full weekend out of it. I love museums, and the Museum of Science and Industry and the Field Museum of Natural History are two of my favorites. I visited both many times when my grandparents lived in the Chicago suburbs, but I haven’t been to either in over a decade. The two museums and the recording of MPU would make a nice weekend trip. One of the nice things about Chicago is that it’s one of the few cities I can get a direct flight to from Wichita. I was able to fly out late Friday afternoon. I spent the day on Saturday at the Museum of Science and Industry. It’s changed quite a bit since I was last there and it’s a very interesting museum. I went all out and took the tours of their coal mine mockup and U-505, a captured German submarine. Despite spending the entire day there, I wasn’t quite able to see everything. Over at the Mac Power Users forum, some folks arranged to meet for dinner before the show. We rendezvoused at an Apple Store near the venue and to a nearby Mexican restaurant.1 It was great spending some time talking to fellow MPU listeners. We headed over to the venue and got there just before the doors opened at 7pm. Before the show, I had a chance to talk with Focused co-host Mike Schmitz, as well as recent Focused guest Chris Bailey. One that was obvious as soon as we entered the theater was that there were three microphones up on stage. This lead to some speculation about who might be guesting on the live show. Things got rolling about 7:30 as David Sparks and Stephen Hackett came out (to much applause). 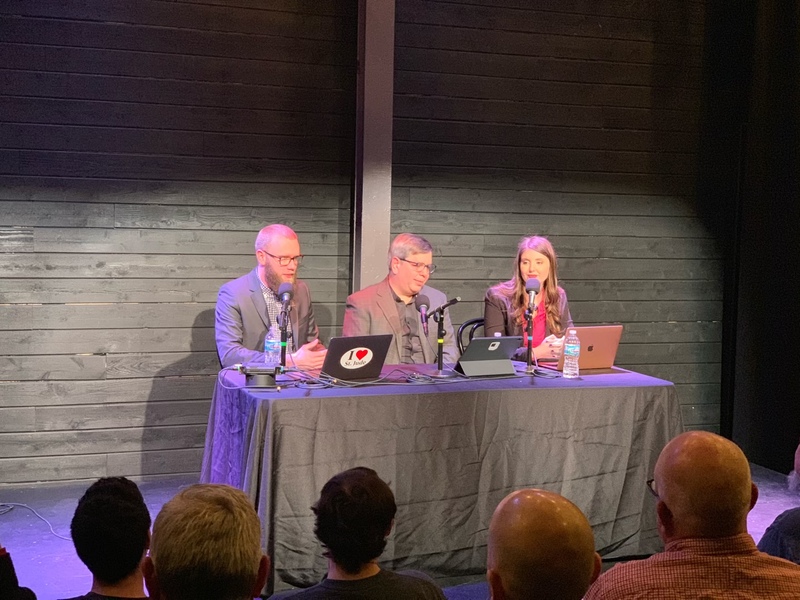 After some discussion of David’s misadventures with a missing Documents folder on his iMac Pro, they were joined by Rose Orchard (co-host of Automators. She and Stephen discussed the new MacBook Air, which they both seem to like quite a bit. Rose was not the only special guest though. After the discussion of the Air, they brought out Mike Hurley, co-founder of Relay FM. 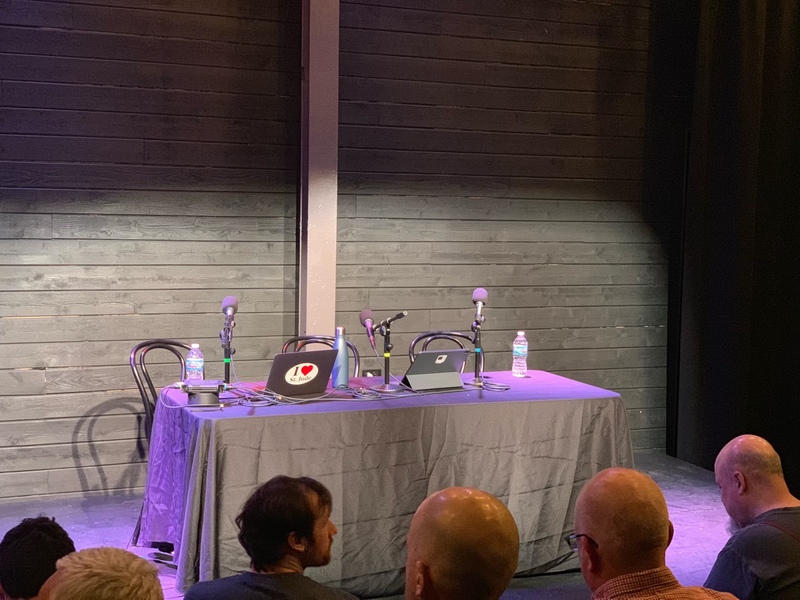 Getting two guests to take transatlantic flights to appear at your live podcast recording is pretty impressive, and seeing Myke and Rose was a real treat. The rest of the show just flew by. Afterward, folks who scored the “VIP” tickets (about half the audience) got to hang around for a meet and greet. David, Stephen, Rose, and Mike put in a lot of time talking to folks (it seemed like David, in particular, was really enjoying it). In addition to the hosts and guest, there was a selection of other podcasters/bloggers in the audience as well. Beyond the aforementioned Mike Schmitz and Chris Bailey, I also had a chance to talk with Mike Potter, organizer Macstock. Talking to him has me pretty excited about going to Macstock for the first time in July (I’d bought a ticket even before they announced that Mac Power Users episode 500 would be recorded live at the conference). I didn’t even get a chance to talk to Alex Cox of Supercomputer or John Voorhees of MacStories. But beyond the big names, I enjoyed the opportunity to talk with fellow Mac Power Users listeners. It’s always good to get a chance to share some fellowship with folks who have common interests. All told it was quite late by the time I headed out and about midnight when I got back to the hotel. On Sunday I spent the day at the Field Museum of Natural History. It, too, has quite a few new exhibits from the last time I was there. However, I do remember some that date back to my previous visit a decade or so ago. The new exhibits include an excellent dinosaur exhibition and some good touring exhibits on mummies (both Peruvian and Egyptian) and ancient China. After a nice dinner at a local English style pub, I headed out to O’Hare for my late flight home. At the airport I found my flight had been delayed even later. Then back in Wichita the temperature was in the single digits, and I wasn’t able to get my car started. I finally took an Uber, arriving home about 2am. Save for the last minute issue with my car, this was a great trip. Going to a live Mac Power Users recording was a fantastic experience. I’m very happy that I took the plunge and decided to come. 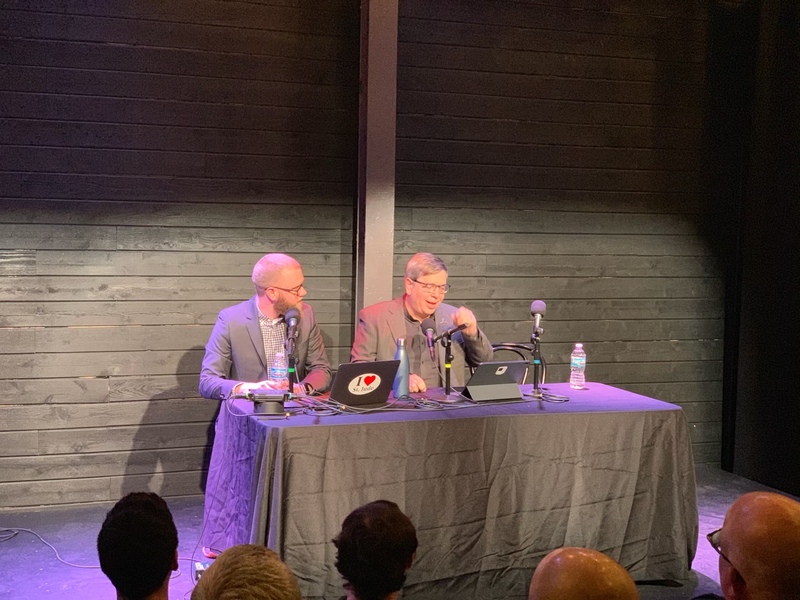 The recording itself was pretty neat, but the real highlight was the chance to talk with David, Stephen, Rose, and a lot of fellow Mac Power Users listeners. This really has me looking forward to coming back to Chicago for Macstock this summer.